A year or two ago, I discovered that cooking apple slices in just water and cinnamon makes a really delicious, healthy dessert or even snack, so I’m sharing my super simple method for cinnamon skillet apples with you today. 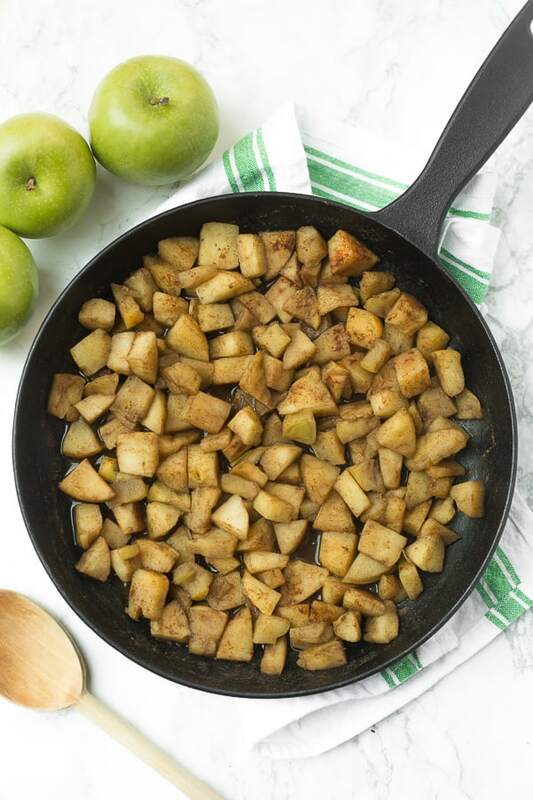 It’s a healthier alternative to traditional fried apples recipes, which typically call for loads of sugar and butter. This recipe has just three ingredients- apples, cinnamon, and water, and it’s hard to mess up. And an added bonus is that since the recipe actually doesn’t use dairy, honey, etc., it’s happens to be vegan-friendly and allergy-friendly! I like using granny smith apples since they’re tart, firm, and great for baking, and they’re actually the lowest in sugar out of all the apple varieties. 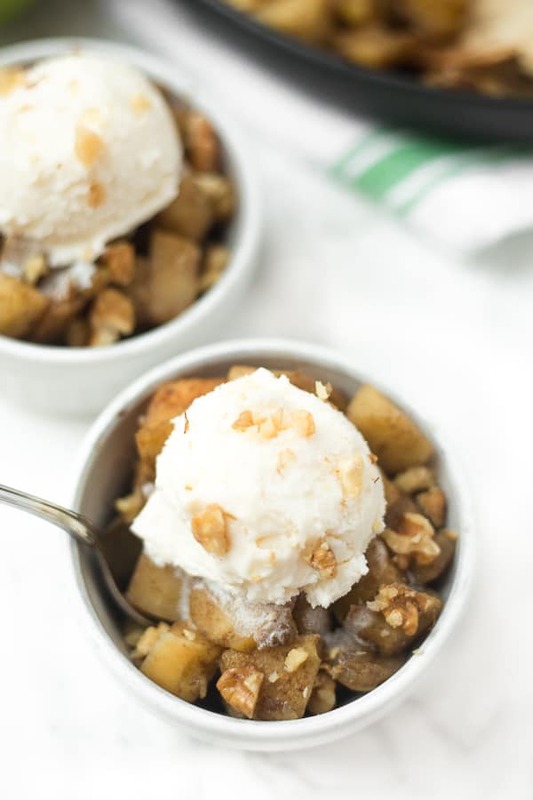 I first made these cinnamon skillet apples for my family a few years ago since most of them were following a low-sugar eating plan, and they still request these apples all the time! 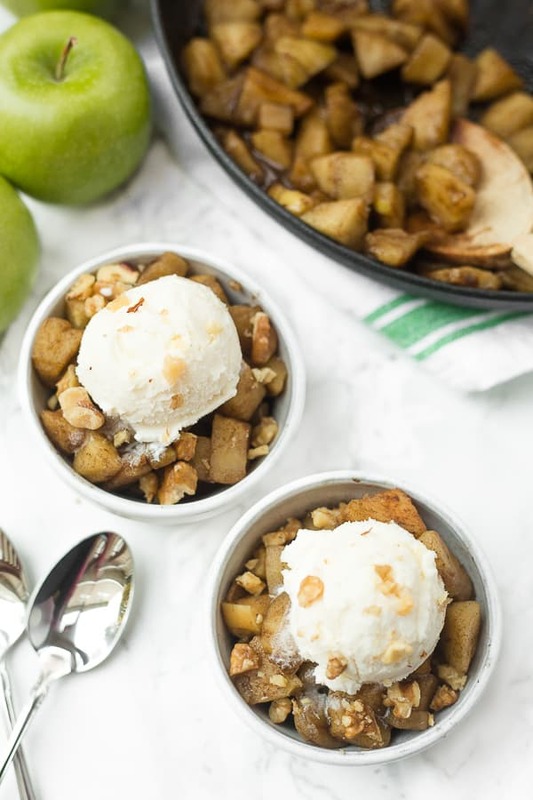 If you serve these skillet apples a la mode, it’s almost just like eating warm apple cobbler. I’ve also stirred leftover cinnamon skillet apples into plain Greek yogurt or oatmeal, which is amazing. My two very favorite healthy desserts (this and my favorite healthy apple crisp) use apples, so I have this inexpensive peeler/corer/slicer that’s a total game changer when it comes to apple desserts. It cuts the prep time way down, all of the pieces are a uniform size, and you don’t have to worry about nicking yourself while peeling with a vegetable peeler. LOVE this thing. If you try these healthy cinnamon skillet apples, feel free to let me know in a comment or post a picture and tag me @livbane on Instagram– I’d love to see! Hope you enjoy! Peel and chop apples into small, fairly uniform pieces, about 1/4 inch thick. Place a medium skillet onto medium-low heat and add water. Add apples and cinnamon to taste, stirring and cooking until apples are softened, about 6-10 minutes. If all of the water evaporates, add a little more water as the apples cook. Add cooked apples to serving bowls and top with nuts and a scoop of vanilla ice cream or a dollop of freshly whipped cream. Store leftover apples in the refrigerator for up to 4 days and reheat in the microwave for 20 seconds, or stir them into oatmeal or vanilla/plain yogurt– no need to reheat! I love baked apples but I’ve never thought about heating them on the skillet. Thanks for the easy recipe with minimal ingredients. These sound great! My favorite apple to eat is “gala” and definitely a la mode dessert! Definitely going to have to try this! Makes me feel warm and cozy just reading it. I crave these all the time! One of my favorite “desserts”!!!! So do I! I’ll have to make them again soon! Yum. Yum. Yum. I always love a scoop (or two!) of ice cream on top of my dessert! I love doing this! Warm, spiced apples scream comfort to me. My favorite apples are Braeburns and Honeycrisps, but I feel like they have a super short “good” season, so I eat a lot of Jazz and Gala apples since they’re always around 🙂 And yes to a la mode everything! Pretty much any hot dessert could be improved with some melty ice cream. Mmmm… Yes, and these could work so well for people with allergies, because it’s so simple and so delish. You could even do different kinds of whipped cream like coconut whipped cream or regular whipped cream. Now you’re making me want cooked apples for breakfast. I say go for it 🙂 And yes! Coconut whipped cream is a great idea! Oh yes, and my favorite type of apple to eat is probably a Gala or a Honey Crisp, but Granny Smiths work AMAZINGLY for baking! Yes!! I love cooking apples this way. So warm and comforting. And so simple too! I love using these to top my pancakes or waffles with! Ooh yes, I bet these would be amazing on waffles or pancakes! Love that idea. Have you ever tried to make a single portion of this recipe with just one apple? Looks delicious! Hi, Lizzy! I’ve done a single-serving version in a skillet with a couple of tablespoons of water and about 1/2 teaspoon of cinnamon. I’ve also done the same thing in the microwave by putting it all in a mug and microwaving for about 1 1/2 minutes. So good! Mmmh, yes. Apples and cinnamon are one of those matches made in heaven. Your recipe sounds simple but so satisfying. 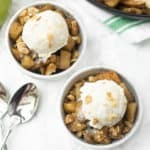 My family used to eat apple crumble topped with a mix of sour cream and créme fraîche in autumn all the time so I can see how the flavours of your dish would work amazingly with a scoop of ice cream. I really like Pinova apples for snacking and Boskoop for both that and baking. Pink Lady should be cheaper :). I haven’t tried Pinova or Boskoop apples! I actually don’t think I’ve even seen them at grocery stores near me but I’m intrigued! I totally agree about red delicious apples- they always taste a little grainy and mushy to me, too. Love galas, though. And you’re right, it’s hard to go wrong with a scoop of PB on top of just about anything! This is like the healthier and easier version of apple pie. I totally dig this and would love to add these apples to some oatmeal, mmmmm! Mmm yes, I love stirring leftover cinnamon apples into my oatmeal or even cooking chopped raw apples right into it! I really think my favorite dessert is any dessert that involves warm spiced apples. Apple pie, baked apples, I even love to saute apples and cinnamon and put it in my oatmeal. This looks perfect with the ice cream, yum! Cooked apples are so good! There’s just something about warm apples + ice cream. I’d have to say my fav apple is golden delicious. Particularly picked straight off a tree! Love golden delicious, too! And I agree- what IS it about warm apples and ice cream?! So good! I normally go for Galas but also enjoy a Pink Lady or Jazz apple when they come into season. If you have a lot of apples left over, cooking them like this and freezing them is also a great way to extend their lifespan and gives you instant apple and cinnamon compote once warmed again in the microwave! Awesome tip about freezing the apples, Charlotte!! I’ll have to make extras next time (& refrain from eating all of them!) so I can try it out!! I made baked apples once. It was a lot of work, but they were so good! I think I demolished them in a day or two because I couldn’t resist. Just made these, looking all over for simple, low cal recipe for baked apples. Had with Greek yogurt and pecans. Delicious. Thank you! So glad to hear you enjoyed these, Bethany! The apples with Greek yogurt and pecans sounds delicious. Just made a single serving with Gala, walnuts and greek yogurt..delicious!! Added a little vanilla. No guilt. Mmmm sounds delicious, Flo! Thanks for sharing! I came into three Granny Smith Apples that I didn’t want. Not an apple I like. I couldn’t find anyone else who wanted my three Granny Smith Apples either; so, I googled, and ended up here. I’m looking so forward to trying this recipe and sharing with my good friend Joyce. Fun! Gratitude! What a nice print out, to boot! Hi Grayce! I haven’t tried it but I’m sure you could! I’m not sure how long it would take but you could just keep an eye on the apples and check them periodically so they don’t turn to mush! I personally enjoy McIntosh apples the most for baking and eating, pink lady are a close second. For this recipe while delish on its own I added some vanilla, nutmeg, dash of salt, and god forgive me, some butter flavored cook spray while cooling and tossed. I just can’t have apples without some creamy butter flavoring! Sounds like yummy additions! I’m sure vanilla and nutmeg would be amazing in these apples! Just made this last night. I used Honey Crips Apples my favorite. I’m on Weight Watchers so I used 1/2 cup of Salted Carmel Halo Ice Cream on top. It was so good!! Thanks! Mmm, love honey crisps! I’m so glad you enjoyed these skillet apples! Hooray!! 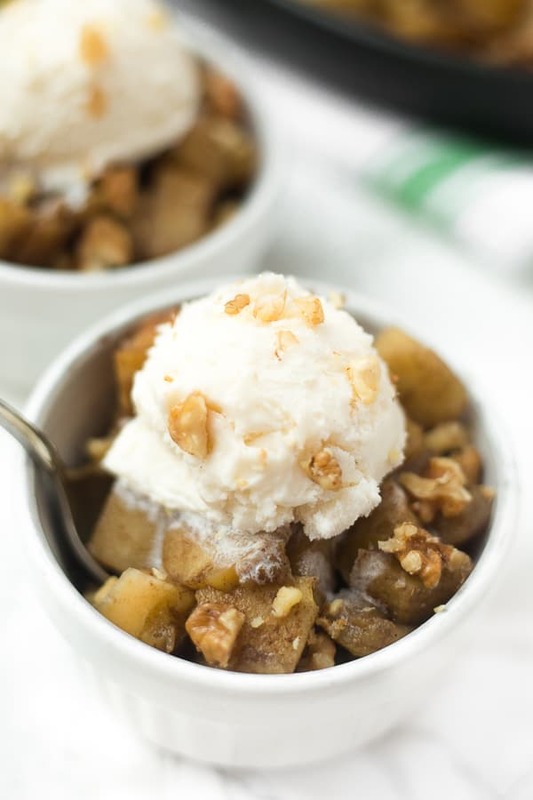 I’m so glad to hear you loved this easy apple recipe!! The kids love Granny Smith Apples. I will make them some of these! love cinnamon apples! But I usually make them the unhealthy way with brown sugar and butter lol i’m excited to try this version! Hope you love this method of making cinnamon apples, Lexi! Yum! Thanks for sharing. I’m going be making this tomorrow. I love how cinnamon completely complements apples. I just made this dish. I added 1/2 cup of chopped Omega-3 Deluxe Nut mix to the apples as they cooked. It is absolutely delicious. Didn’t top with ice cream but topped with Ready Whip. Really, really good.